Written by rbolton about 7 years ago. Very interesting and lots of food for thought! 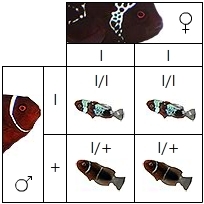 With the horned maroon variety, I wonder about the more than 1 allele theory – perhaps with 2 alleles involved you have more options for intermediary forms if there is partial dominance on at least one of the alleles? It would be really nice if there was some geneticist (or PhD candidate) who wanted to take this project on and do actual genetic mapping from a skin scrape of the lightning, the male, and the babies. 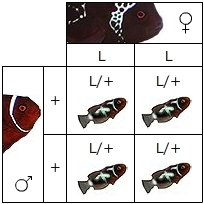 It would also be neat to pair one of the lightning babies with a young horned maroon, unless of course it is a single allele and therefore no relationship between these two forms. I really like the idea of openly documenting F1 pairings and resulting off-spring to further understand the genetic picture. This project has been so wonderful because of its transparency [too often an amazing fish is purchased and then disappears from the public radar screen and remains a mystery - the rose-magenta skunks come to mind]). If you do open up any of the off-spring to hobbiest breeders w/ no prior experience, count me in!! I’d love to take on this project! Written by Pickle about 7 years ago. Matt – this is awesome. Thanks for breaking down the genetics. 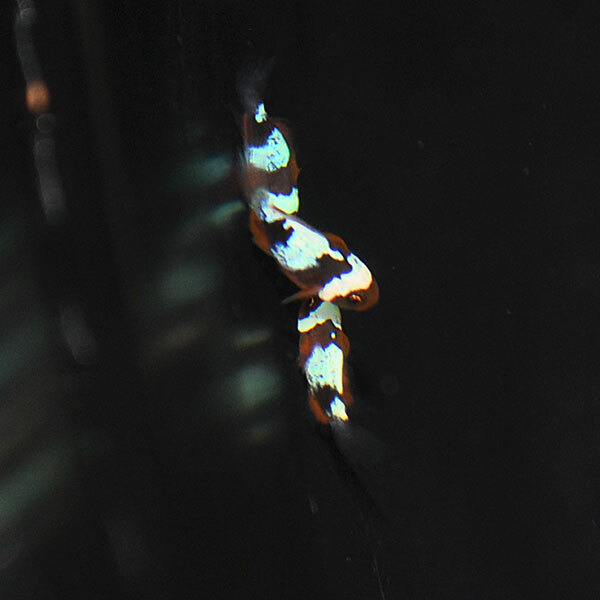 I’m in my third year breeding clowns and I’m taking the next step and expanding my growout right now. 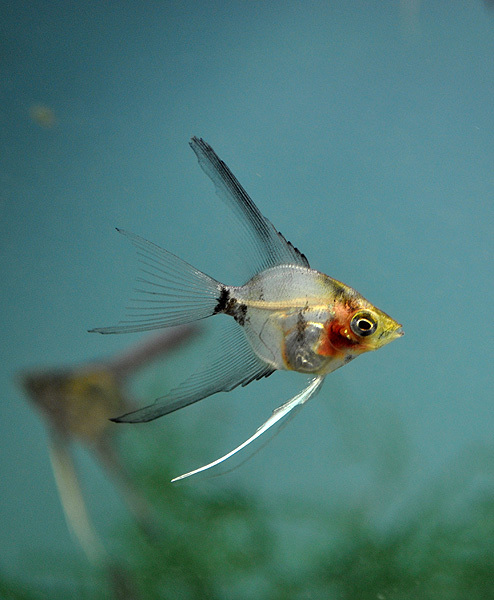 Currently I’m working with 3 breeding pairs and 6 others waiting to spawn. All along I’ve been doing what I can to share the knowledge I’ve gained along the way to help others avoid my mistakes. What I noticed from the start is information is difficult to come by and most of what I’ve learned has come from counless hours of reading, pestering more experienced breeders and my own trail and error. With all that being said I am constantly learning and sincerely appreciate your perspective. So again – a huge thank you for keeping this blog going and making it so informative. It really helps shed light on a lot of questions. Written by Mrbailey about 7 years ago. 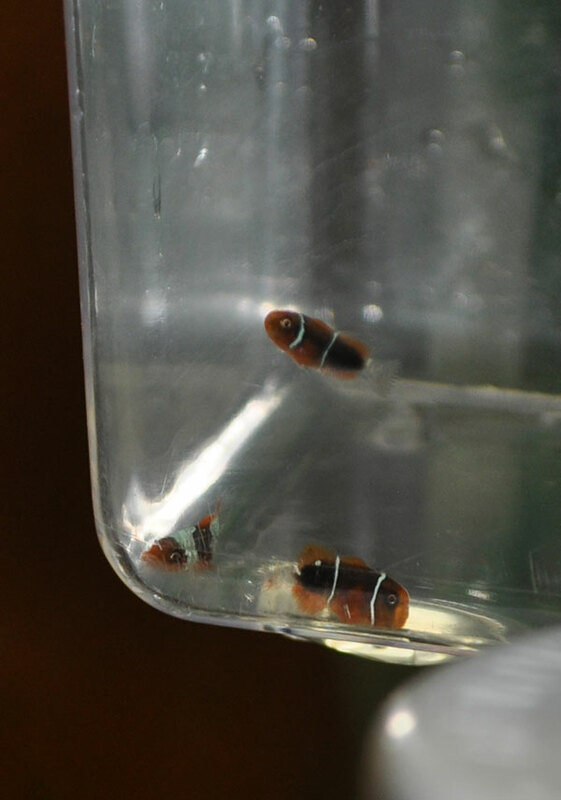 Interestingly, I believe that due to the nature of the patterning that you see in clownfish during early development, there would likely be a chemical signal given to the cells along the typical barred path that determines whether the cell produces white or red pigment. As all cells would contain the genetic code needed for both colours, they need to be given a signal to express a particular gene (colour). The way that it looks like the stripes have developed, kind of looks like there has been a miscommunication of this signal down the designated path. If the lightning gene is a mutation, it could easily be chromosomal…. Where the gene has been spliced from the chromosome during meiosis or changed loci to a nonhomologous chromosome…. The resultant protein being inactive (this would usually mean a recessive mutation as there is still one functional gene) or disruptive to the expression process (a protein could for instance bind with a molecule, but no longer be functional enough to release it or do the designated process… Leading to dominance). If I had to guess, I’d say given the results that you are seeing the trait is most likely the result of a single pair of genes with, those showing a lightning pattern carrying a mutated gene involved in sending the signal to cells within the typically barred zone with the gene actively blocking or interrupting the normaly travelled path. 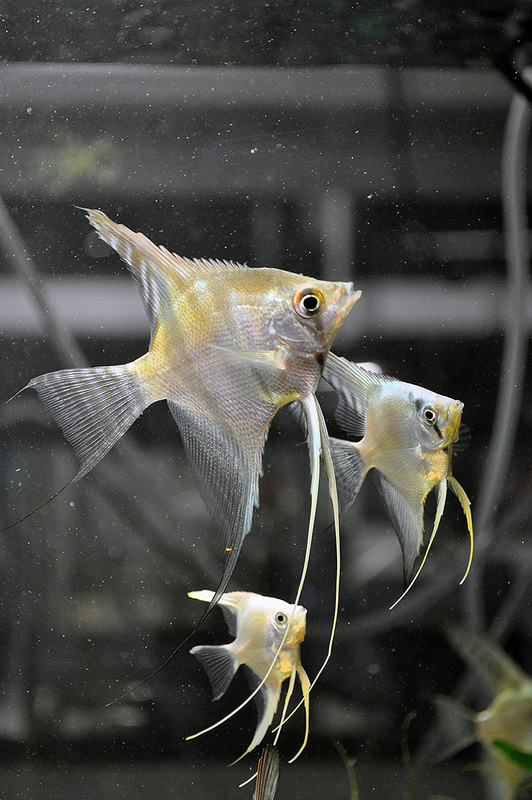 The resulting gene could be dominant, with exciting possibilities should a fish be homozygous for this mutation in the next generation. Written by Andy about 7 years ago. Great post, Matt. Very interesting. With regard to this statement, “If this trait is dominant, then it might also suggest that this mutation ought not to be as rare as we currently are led to believe it is.” Yes, unless of course your theory is also true that this mutation also conveys a greater chance of predation. Greater predation could still result in the trait being rare in the wild, but should become evident quickly once captive breeding ramps up. That said, I’m betting with you. Written by frank M about 7 years ago. I have to say congrats on your success and this nice piece of thoughtful assessment. I know this is just the start of many more spawns and more success. I also wanted to point out, a few yrs back you and I discussed genetics on the Marinedepot webforum, and i provided you a series of outcome percentiles based on Het/Hom breedings. Thanks for chiming in to clear up some details. Should you get any offspring and they all “appear normal” then back breeding any F1 female w/ that lighting male will yield you a heterozygous offspring w/ 65% genetics of lighting. Seems my math was close- your Het calculations of 62% fall inline w/ my predicted 65% based on my best guess of an incomplete dominance model back then. Never the less, your sitting pretty. Congrats again, this is outstanding. Egads – you’re ALIVE! My emails to you had been bouncing back Nice to see you posting Frank. Frank, I’m actually still confused by your 65% prediction, and posted as much back in 2010 (see the last comment in the thread on MD in 2010). To this day, I’m not really sure where the 65% figure on the back cross comes from, but I would love to hear you explain the thinking that went into your 65% and 40% figures. Also I think you’re misunderstanding the 62% figure in this writeup; that figure in no way represents a “quantity of genetics” or a “rate of phenotype occurring”. That 62% figure is a hypothetical weighted probability of the possible genetic makeup of the Lightning Maroon itself. 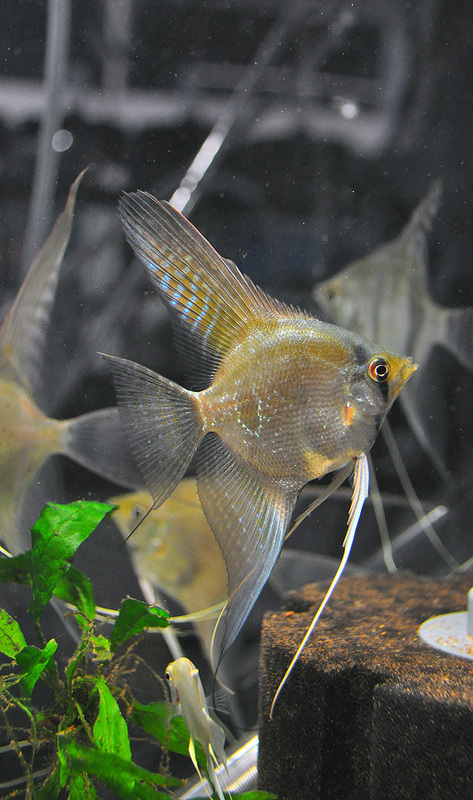 It is based on a weighted spread of known genetic traits in FW angelfish, applied to the various classes of traits (dominant, partial dominant, recessive), and specifically relates back to the possibility that the Lightning Maroon’s genetic makeup represents a heterozygous (L/+) pair of alleles at the “Lightning” locus, vs. the other possibility. 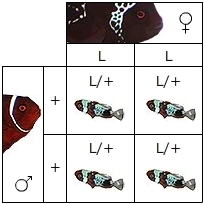 Without the weighting (again, derived from Angelfish), it is simply a 2/3 chance that, based on the observed phenotypes in the F1 offspring, that the Lightning is (L/+), and only 1/3 chance it would be (l/l) – recessive. If the known frequency of recessive traits in Angelfish is comparable to the “potential” frequency for recessive traits in Maroon Clownfish, then there would be a slightly higher 38% chance that the Lightning trait could be recessive, and thus, (l/l). Make sense? Written by mago about 7 years ago. If it is recessive (which I doubt) all F2 offspring will be lightnings. If it is dominant 75% of F2 offspring will be lightnings and 25% wild-type. 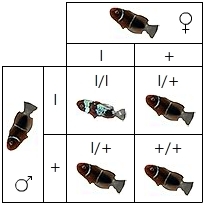 If it is partially-dominant (I also believe this is the case) 25% of F2 offspring will be wild type, 50% will be lightnings and the remaining 25% will be super-lightnings carrying a double-dose of the lightning allele. Anyways it will be fascinating to find out. Yes, if I was correct in my initial assessments, and there aren’t any genetic curve balls, that would be the proof. Written by Todd about 7 years ago. Many will obviously talk about the potential price to be put on the offspring with lightning traits, but the genetic analysis has me wondering what value will be placed on the offspring that show no lightning trait. If I am reading everything correctly, your estimates would mean that there is a 38% chance that those that show now lightning are still carrying the gene. 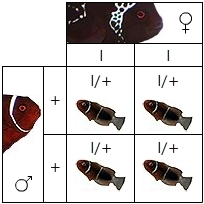 I can’t imagine you will keep them all until the genetics are proven, so what value does one place on a fish that has a 62% chance of being +/+. P.S.- 9 days without an update? You’re killing me! Todd, indeed, that’s a very intriguing question. 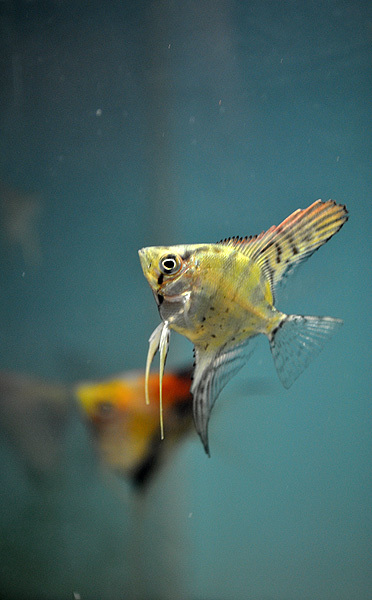 Since it is a total and complete mystery, I suppose you could look at this another way – how much value were people willing to place on a fish that may or may not have carried a “genetic” trait in the first place. A normally-patterned White Stripe Maroon retails on Blue Zoo for $34.95 at the 2-3″ range. Of course, the problem here isn’t that 38% of the normally patterned Lightning offspring WILL have the genetics, rather it’s a 33 or 38% that ANY will, based on my math. However, the other concern is this – how many breeders will prefer to pair a Lightning Maroon with either another Lightning Maroon OR a sibling? That is probably where the real demand comes from…not from someone who wants two normally patterned siblings. 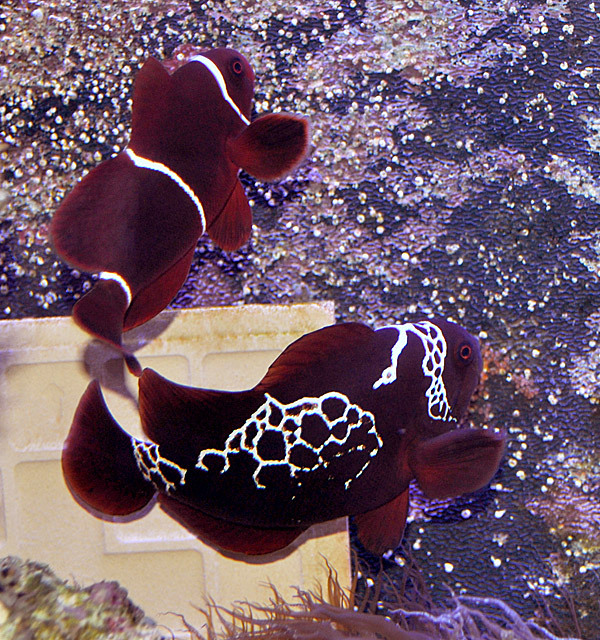 Then again, as the fish are growing, we are starting to see more spotted maroons and even one that would fall into the “Horned” phenotype. How much more does a Horned Maroon sell for??? I’ll have to go find out! Well the ones Blue Zoo currently have are not from PNG. 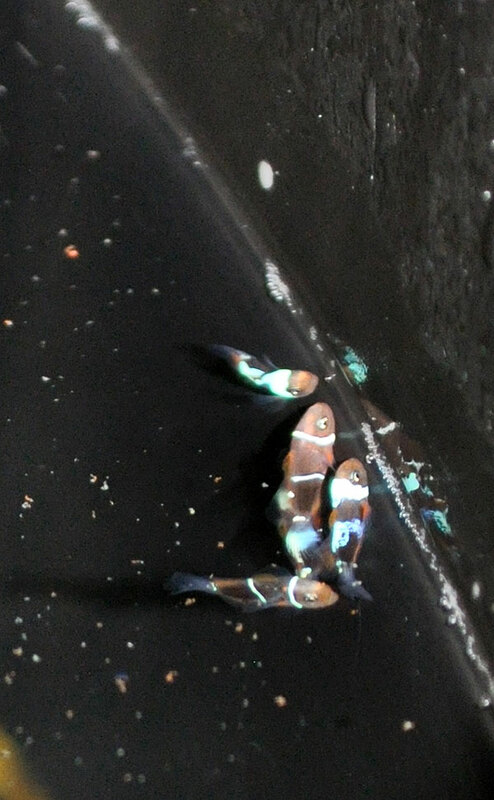 If it is a recessive trait, and your non-lighting PGN fish is carrying it, I think the chances are good that it is a gene not found in more common collection waters (or we would have seen it before). Now how about a new blog post for us? Please? So if one of the offspring is horned, does that change the genetic hypotheses at all? 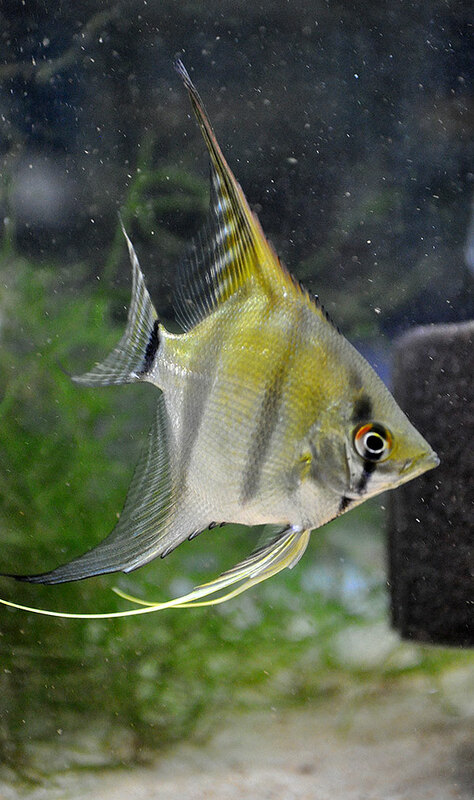 Well, it depends on whether you think that there is a genetic basis for fish being “horned” or if you think this is just the normal “flake” type of overbarring that has been known in captive-bred maroons for quite some time. And if “horned” was in fact a genetic trait, it could be that “horning” and “lightning” are independent of each other. It will be interesting to see how things shake up as the babies grow out. Written by 2012 Marine Breeder’s Year in Review about 6 years ago. Written by John Meyer about 6 years ago. Matt, very nice job at showing all of the genetic possibilities. I agree with most of what you have said so far. 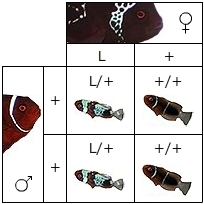 There is one other possible outcome, however, if the L gene exhibits partial or complete dominance. If by breeding 2 lightnings together you see a ratio of 66% lightning to 33% normal, it could mean that the L/L combination is lethal. This is seen in some dominant genes in chinchillas such as the mosaic and velvet genes. You may just get 25% of the eggs that fail to hatch or die shortly thereafter. So it could be possible that the L/L combination will produce nothing viable. But if that is the case, you would expect to see 66% lightnings and 33% normal from the 50% L/+ and 25% +/+ genotypes. 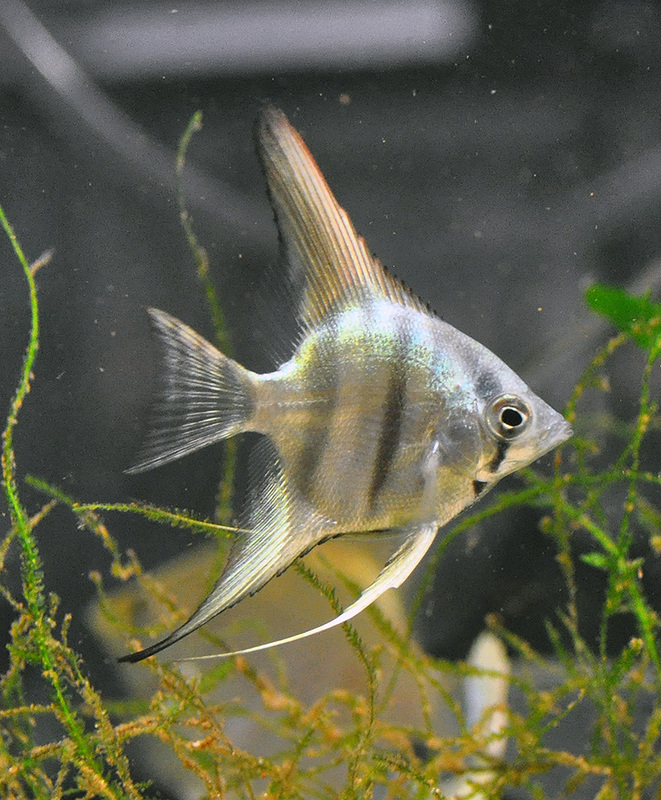 Written by FAQ – Will the White Stripe Siblings Throw Lightning Offspring? – The Lightning Project about 6 years ago.